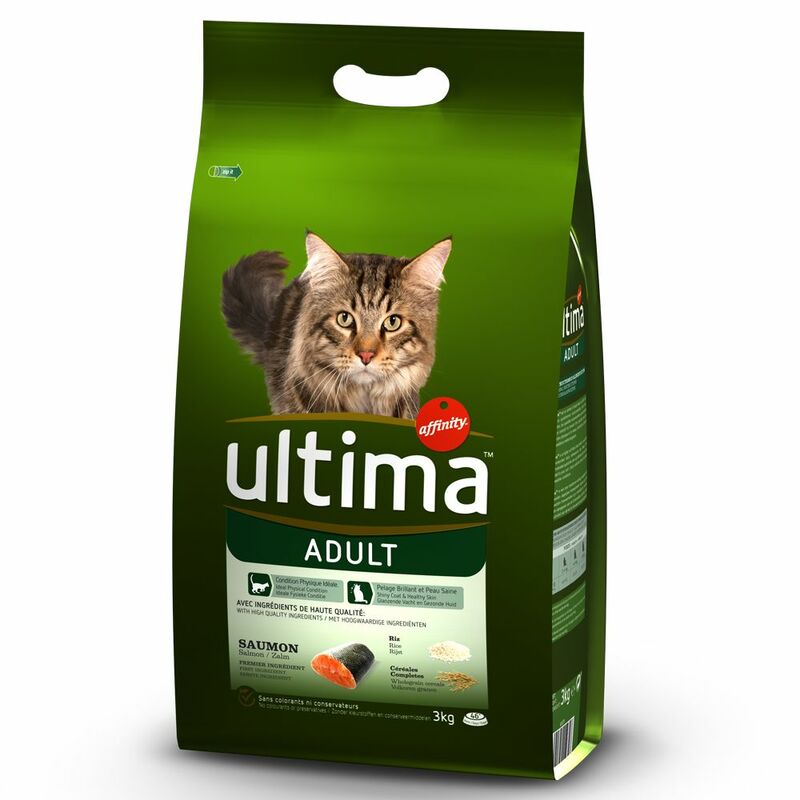 The delicious recipe of Ultima Adult Salmon and Rice has been formulated to help your cat to stay in the best physical condition. High quality protein from salmon provide energy and help your cat develop strong, lean muscle. This tasty complete food also contains Omega-3 and Omega-6 fatty acids that help to keep your cat's skin healthy and produce a shiny, gloΒy coat. A balance mix of vitamins and minerals in ensures your cat consumes all of the nutrients that it needs within its daily diet. This dry kibble combines salmon with easily digested rice and wholegrain cereals, which can help to boost good gut flora and healthy digestion. Ultima Salmon also contains taurine, which is eΒential for cats and can boost eyesight, heart and nerve function. As with all Ultima products, only the best ingredients are used, under strict quality controls. The product is gently steam cooked to preserve the natural nutrients and flavours of the original ingredients, then it is packaged in resealable pouches, to keep the kibble fresh for a long time after the pack is first opened. Affinity Ultima Adult Salmon and Rice dry cat food at a glance High quality complete food for adult cats For optimal physical condition: with an ideal combination of proteins, vitamins and minerals Premium protein: salmon is a good quality source of protein and provides energy and the basis for strong, lean muscle With Omega-3 and Omega-6 fatty acids: for healthy skin and a shiny coat With rice and wholegrain cereals: sources of good carbohydrate that help regulate digestion With taurine: to support cognitive function, eyesight and nerves Gently steam cooked: to preserve nutrients and flavour High standards of food safety: strictly controlled manufacturing proceΒes with high standards Resealable pouch: for freshneΒ Tasty kibble: oven-dried No colourings or preservatives. Price just £11.99! Click here to buy now!